For two years we worked on identifying the needs of our community through citizen participation in forums, focus groups, surveys and working committees. It is now time to take things to the next level: all citizens of Southern West Island (those who reside, work or are students here) are invited to participate in a discussion and priority-selection exercise. At the event, participants will be given a summary of the needs identified in Southern West Island , followed by the selection of priorities to be included in a 5-year action-plan. Citizens will make decisions about the changes about the future of their communities. 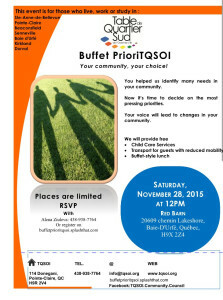 We look forward to welcoming you in large numbers on November 28 from 12 p.m. to 4 p.m. at: The Red Barn, 20609 Lakeshore Road, Baie-D’Urfe, Quebec H9X 2Z4. A free lunch & daycare services are offered. Places are limited. Please click here to register. Please click here to read our November newsletter. 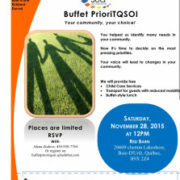 TQSOI’s Guide for Voters Citizens Have Their Say!